US-VISIT is a top priority for the U.S. Department of Homeland Security because it enhances security for our citizens and visitors while facilitating legitimate travel and trade across our borders. US-VISIT helps to secure our borders, facilitate the entry and exit process and enhance the integrity of our immigration system while respecting the privacy of our visitors. US-VISIT is part of a continuum of security measures that begins outside U.S. borders and continues through a visitor's arrival in and departure from the United States . It incorporates eligibility determinations made by both the Departments of Homeland Security and State. US-VISIT currently applies to all visitors (with limited exemptions) entering the United States , regardless of country of origin or whether they are traveling on a visa. 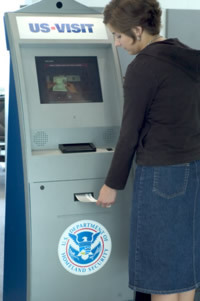 Most visitors experience US-VISIT's biometric procedures â€“ digital, inkless fingerscans and digital photograph â€“ upon entry to the United States . In those cases where a visitor requires a visa, the Department of State collects the visitor's biometric and biographic information, which is then checked against watch lists, thereby improving the Department of State's ability to make a visa determination. When the visitor arrives in the United States, US-VISIT procedures allow the Department of Homeland Security to determine whether the person applying for entry is the same person who was issued the visa by the Department of State, and additional watch list checks improve the Department of Homeland Security's ability to make admissibility decisions. US-VISIT entry procedures are currently in place at 115 airports, 15 seaports and in the secondary inspection areas of the 50 busiest land ports of entry. Entry procedures will be deployed to the remaining land ports of entry by December 31, 2005. As US-VISIT moves toward fulfilling its vision for an automated entry-exit system at the land border ports of entry into the United States , US-VISIT is continuing to improve the border management system by planning tests of radio frequency identification (RFID) technology at the U.S. land borders.